On Thursday, the 18th September 2014, Riverview Bingo Palace (Chatham) completed their final phase of conversion to the c-Gaming Program with the introduction of the Taptix Units. It was extremely encouraging to see the positive way that Ms. Carla Fox and Team Chatham have embraced the Revitalization Initiative and are looking forward to re-building the business for the benefit of all partners. They remain an important source of local, direct and meaningful funding for locally based Community/Non Profit Groups. The Centre has seen a large internal investment that is focused on the customer environment and creating a relaxing and enjoyable ambience/experience for them. There was strong Charity information in the foyer area and a Community information board highlighting various community events, which was encouraging to see. Not often mentioned, but should be acknowledged, was the field presence of the OLG Team headed by Mr. Egan Fitzpatrick who has guided the Centre through this conversion process spending many countless hours on the road and the vendors/suppliers (Arrow Games & Diamond Game) who have supported the launch of their equipment or products, which has been tremendous and makes the whole conversion process easier. Now that phase one of the conversion process has been completed and the support team drifts away, Ms. Carla Fox and Team Chatham can begin the work of re-building the business and strengthening the important contribution that Riverview Bingo Palace makes to the life of the City of Chatham. Good Luck Carla as you move forward. As we head into the fall of 2014, we continue to see the initiative gaining traction. The recent launch of Riverview Bingo Palace (Chatham) now takes the total Charitable Bingo Centres converted to twenty four (24). This becomes the largest single channel for Venue Gaming in the province. It speaks volumes for the partnership among all stakeholders in continuing to deliver this important government initiative for the numerous communities around the province who benefit from hosting a Charitable Gaming Centre in their municipality. The Charitable Gaming Sector in Ontario has been long established for well over thirty (30) years and has had a lengthy history of making a considerable contribution to the life of the host communities. This is often overlooked or forgotten when looking at the changing landscape of the gaming sector in Ontario. Over the last twenty years (20yrs) the Bingo Sector has faced tremendous competitive challenges from government led gaming initiatives (Resort Casino’s & Racino’s). This has seen the sector decline from 214 Centres to the present day 61. This initiative, the Revitalization of Charitable (Bingo) Gaming, finally gives an opportunity to ensure that we can re-establish Charitable Gaming in the province. Fort Erie - On the 8th October 2014, Delta Gaming Centre (Uncle Sam’s) Fort Erie will convert to c-Gaming. It will join the other Centre (Golden Nugget) in the town who converted earlier this year. Simcoe - In November 2014 we will see the third (3rd) small Centre converted over to c-Gaming. This will join its sister location in Leamington who converted a couple of months ago. Thunder Bay - As we close out the year in December, we head north to Thunder Bay as they launch the c-Gaming Centre. This is the first fully ‘Charitable’ owned and operated Centre to join the initiative. They have undergone a tremendous change with a new location and a total re-branding of the Centre to Superior Shores Gaming Centre (see below). Toolbox - Additional materials are being added to the Toolbox for Centres to promote the conversion and product change. This material has been aligned and cross referenced to the recent research and will likely be available from November 2014. The OLG c-Gaming Team and CGAO Representatives have been working with the OLG Marketing Agency in producing these materials. They are designed to follow on from the Bingo is Back campaign. Marketing Funds - The CGAO has been engaged in discussion with the OLG over the 2% & 5% Marketing Funds, how they are deployed and who is responsible for what. This has been a constructive exercise and we will be re-grouping to discuss the findings and the critical next steps. We must remember that marketing is a major piece in re-engaging and re-building this sector. Turbo Challenge - The majority of c-Gaming Centres have now been upgraded with Turbo Challenge on their system and are slowly re-introducing this product in their programs. This is an important product as it generates margins with a prizeboard running (with the progressive) at 68.5%. Naturally, this first release is not perfect but we do see consumers re-engaging with the product once the differences are understood from the previous manual systems that operated in Centres. We continue to work with Ms. Diane Gartshore and her team with operational ‘tweaks’ to the system. Taptix Units - Various pieces of product enhancements ranging from Single Ply to Promotional Vouchers are being introduced at this moment. 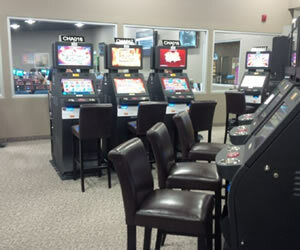 The OLG and Diamond Game (Canada) are working with the Centres to ensure this is completed in a timely fashion and the Centre Manager is aware of the opportunities these changes can bring. There are further upgrades in the pipeline that will make the product more engaging and appealing to our consumers. Taptix Units Measurement - It has been agreed that we will have a clearly defined Measurement Criteria for both the increase in Taptix Units and the re-positioning of low performing units across the whole Taptix estate. This has been worked through with a joint team from the OLG and CGAO and compromises have been given on both sides. Policies - Recently, Mr. Michael McLaughlin & Ms. Joan Martin reached out to our Internal (CGAO) Policies & Procedures working group to go through proposed changes to the P&P’s Manual. This open dialogue between the OLG & CGAO brings tremendous benefit in ensuring that P&P’s are practical and workable at the Centre level. Prizeboard - As we have been mentioning for some time now, we need to engage in a formal process of re-balancing or re-aligning our approach to prizeboards. The objective is to maximize ‘margin’ or net-profit for all stakeholders. Naturally this needs to be completed in a careful and well thought out fashion in order that we retain consumer confidence. We will start this process shortly with Ms. Diane Gartshore. The Charitable Gaming Sector has proven that partnership with government (both municipal & provincial), local non-profit Charity Groups and Commercial Operators does work and achieves meaningful and real results for numerous communities in this province. In early September 2014, SBQ Quebec and four (4) Bingo Centres began a pilot deploying Taptix Units into those pilot Centres. What has been encouraging to see is that SBQ has chosen our two (2) suppliers for the pilot project, being Arrow Games (Canada) and Diamond Game (Canada). The pilot will run for a period of six months and each Centres will have sixteen (16) units in total, being made up of eight (8) from each supplier. On Wednesday, the 17th September 2014, the SWG re-grouped at the AGCO (Head Office) Toronto for the first time in nearly nine months. The SWG has been re-shaped and now has a new Chair, Mr. Jeff Longhurst.These changes are reflective of the re-alignment that is happening across the Charitable Gaming Sector, with nearly 35% of the Bingo Centres now under 207:1:a. There were numerous issues on the agenda and the one directly of note for the Commercial Operators are Registration Categories and Registration Fees. Both will be changing in due course and the CGAO will work directly with the AGCO on communicating them prior to implementation. Going forward it is likely that the SWG will meet on a regular basis, projected to be quarterly. The CGAO strongly supports this engagement with our Regulator. It offers an engagement on issues and ideas that can only benefit the sector at large. Since our last newsletter there has been one major change. Mr. George Sweny - Announced his departure as Senior Vice President, i-Gaming & c-Gaming, on the 11th September 2014 after two (2) years in that role. His leadership of these two critical files for the OLG has been tremendous. He certainly managed to guide c-Gaming through some choppy waters. His deep understanding of the sector and command of the issues enable c-Gaming to march forward. He launched the Taptix Units and forged ahead with the conversion process, which sees at his moment of departure twenty four (24) Centres now part of this partnership program. It was announced that George will be undertaking a position within the private sector in due course. I am sure you will join me in both thanking and wishing George every success in his new career opportunities and for all his hard work and efforts during his time at the OLG. The Rank Group PLC recently announced its 2013/14 fiscal year results. The Group achieved a 13% growth in revenue, driven by its Casino division and operating profit increasing to £72.4m from £69.9m in 2013. The increases were driven through the acquisition of the Gala Casinos in 2013. The Bingo Retail divisions in both the UK (Mecca Bingo) and Spain (Enracha) experienced a challenging trading environment and the Group is reviewing its retail offering and looking to reposition it in due course. The Group led a very successful campaign to reduce tax [bingo duty was cut to 10%]. As part of that, Rank had committed to build three (3) new venues and re-start its venue refurbishments program, of which it is in the middle of reviewing. It continues to develop its ‘Bingo’ multi-channel offering with investing in its digital platform, especially its mobile app channel. The appointment of a new Chief Executive Officer, Mr. Henry Birch,in May 2014 sees Rank set for further development in the future. Mr. Ian Burke will remain as Chairman of the Group. We continue to be very supportive of Responsible Gaming and the balanced approach that the CGAO believes ensures engagement at every level of the process. The Responsible Gaming Council Field Teams are working with our Centres in providing a ‘quarterly’ presence in the c-Gaming Centre once the install of the Kiosks has been completed. The CGAO Members have launched an initiative to drive more engagement with our Charity colleagues in profiling the unique value this sector brings to the communities they are located in. After all the work in converting, it is time to re-connect on jointly profiling our Centres and sharing the good news that they bring. In the coming weeks Commercial Operators will be reaching out to our Charity Executives about this program. Upcoming Conferences - Please note the upcoming conferences.